The BMW X4 will be revealed at the Detroit Motor Show in January, indicating an early 2014 release date, but our spy photographs show pictures of the cars with only minimal camouflage. The X4 loses the boxy shape of the X3 and adopts a sportier stance with a sloping roofline and the lines and contours from the concept revealed at the Shanghai motor show in April 2013. In profile, the silhouette of the X4 mirrors that of the bigger X6 but on a smaller scale. At the front, only the lower air intakes appear to have been restyled when compared to the concept, while the familiar kidney grille with connecting headlight cluster remains. The rear of the X4 is still heavily disguised but an upturned boot lip like that on the X6 is visible. A more conventional twin tailpipe layout has also been favoured in place of the two separate exhausts mounted in the rear bumper on the concept. The test mule also appears to be fitted with the M Sport Package, meaning a more aggressive front and rear bumper design and larger alloy wheels. We still have no shots of the interior but the slopping roofline, like the X6, will have an impact on rear headroom. Boot space is likely to be reduced from the 550-litres in X3 to around 500 litres in the X4. Engines are still yet to be confirmed, but the line-up is expected to be shared with the X3. Therefore, the entry-level X4 20d will be powered by the 181bhp 2.0-litre diesel and the X4 30d fitted with the 254bhp 3.0-litre straight-six. 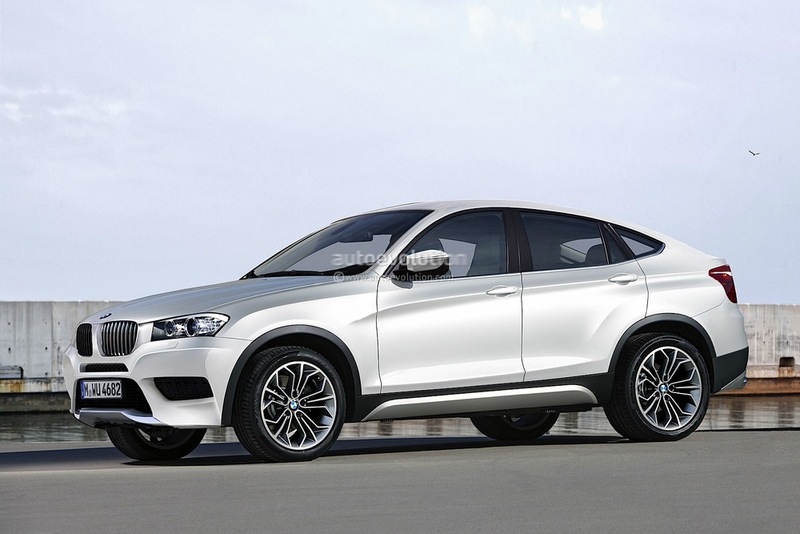 The X4 will be based on the same platform as the X3, so both rear wheel-drive and xDrive variants will be available. Sales of the X4 are expected to start in the first half of 2014 following its unveiling in Detroit, with prices likely to start from around £30,000. In previous spy pictures, just visible through the stickers were the two distinctive, downturned creases from the concept car - one over the rear wheelarch, and the other bisecting the new production-ready door handles. The same grille arrangement, with the headlights connected directly to it, was carried over, but intakes on the lower front bumper appeared to have been shrunk compared with the concept. Larger, less sculptured wing mirrors have been fitted too, while the sweeping rear light clusters can just be seen bulging under the stickers. A simpler rear bumper with a twin tailpipe layout replaces the two wide-spaced, larger diameter pipes from the concept. Despite being the exact same length, and with an identical wheelbase to the X3, the X4 is 53mm lower and 34mm wider. That gives it a more aggressive stance, but will also impact on practicality. Expect boot space to drop from 550-litres in the X3 to around 500-litres in the X4. Rear headroom will be slightly compromised, too. BMW made it clear when it introduced the Concept X4 at the Shanghai Motor Show that it previewed a production car that would be unveiled later this year. And the concept model showed a clear design link with the X3, with both featuring a fresh LED headlamp pattern flowing straight into the grille. Although the shape of the lights on the Concept X4 were a little more curvy than the angular units fitted to the X3. In profile, the Concept X4 also had the same low-slung, high-riding silhouette as the X6. It had a rising feature line running back from the front wing, joined by another which curved up around the rear wheelarches. The chunky wheelarches were almost squared off – a trick Jeep uses to make its cars look more muscular. As with other BMW X models, matt black plastic cladding surrounded the wheelarches and ran along the side skirts. From head-on, BMW marked out the X4 as one of its coupés by making the outer air intakes a lot more pronounced than the central intake. At the rear, the car looked a bit like the new 3 Series GT. The bumper was a lot deeper, though, and featured some rugged underbody protection and two large exhaust pipes. As previously mentioned, BMW altered the dimensions of the X3 to help create a more dynamic look for the Concept X4. It was exactly the same length, at 4,648mm, and had the same 2,810mm wheelbase, but it was 53mm lower and 34mm wider. That gave it a similarly planted look to the X6. That extra width could be added to the track of the X4 – as it is in the X6 – which could help make it feel a little more stable through corners. Add the lower roofline and lower centre of gravity, and the X4 looks set to be one of the best-handling SUVs in the BMW line-up. "Our Spartanburg plant in Carolina where the X models are built initially produced 120,000 vehicles a year, we invested huge sums and last year it produced 300,000 vehicles. We have another round of investment coming soon which will raise that to 350,000,” he added. No pictures of the interior have been released yet, but BMW will probably keep the layout near-identical to the X3’s, as it has done with the X6, in an effort to minimise development costs. BMW hasn’t provided any details about engines or transmissions – only that the X4 will come with the xDrive four-wheel-drive system. BMW does offer a rear-wheel-drive version of the X3, but hasn’t confirmed whether a 2WD X4 will be available. The company will be hoping to continue the success story started by the X6, which has consistently sold well since it was introduced in 2008. For every two-and-a-half X5s that found homes globally last year, BMW sold one X6. Similar sales figures for the X4 are likely. The car will be built alongside the X3, X5 and X6 at the Spartanburg plant in South Carolina, US.